The presence of large numbers of red blood cells (RBCs) in cord blood samples can reduce the accuracy of assays used to measure hematopoietic stem and progenitor cells (HSPCs). Examples of such assays include the colony-forming unit (CFU) assay, and flow cytometry assays for CD34 expression or aldehyde dehydrogenase (ALDH) activity. 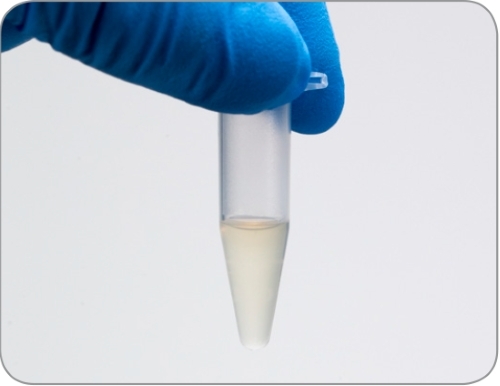 These assays are commonly used by cord blood banks to evaluate the quality of a cord blood unit prior to banking, as part of quality control of cryopreservation protocols, or to aid in selection of units for transplantation. Decreasing the variability in HSPC assays is therefore critically important for cord blood banks. Typical methods for depleting RBCs include sedimentation or ammonium chloride lysis. 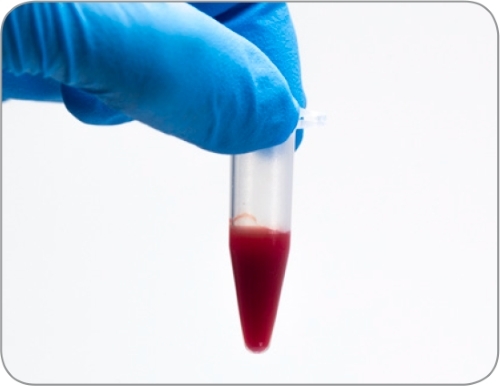 These techniques often include long incubation or centrifugation steps, may not work well with frozen samples, or are not easily performed on small volume samples such as the segments attached to the main cord blood bag. As part of our complete set of tools for standardization of the CFU assay, STEMCELL Technologies has developed the ErythroClear™ Red Blood Cell Depletion Kit (Catalog #01739). This kit enables the depletion of RBCs from up to 16 small (50 - 100 μL) cord blood samples at a time, in only 2 minutes. 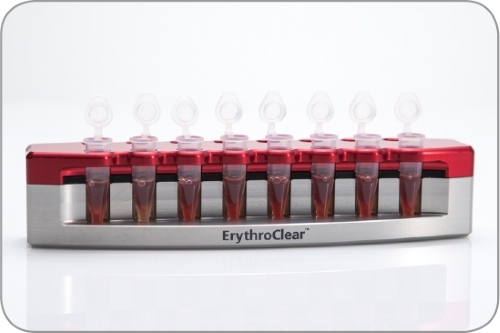 The ErythroClear™ reagent contains immunomagnetic particles that bind to Glycophorin AB+ (GlyAB+) cells, which are then selectively depleted using the ErythroClear™ magnet. Representative STEMvision™ images of cord blood CFU assays (A) with and (B) without ErythroClear™ RBC depletion prior to plating. The expanded orange circles illustrate that it is easier to identify small or diffuse colonies in MethoCult™ medium that is free of RBC background (A vs. B). The frequency of CFUs in Erythroclear™ depleted (y-axis) and non-depleted (x-axis) cord blood samples are shown. One half of each cord blood sample was processed with ErythroClear™ prior to plating in MethoCult™ H4434 Classic medium. The other half of each sample was plated without RBC depletion. The total number of CFUs in the RBC depleted and non-depleted samples were scored manually after 14 days of culture (n = 32 fresh (▲) and 8 frozen (•) cord blood samples; solid line = linear regression best-fit; dotted lines define 95% confidence intervals). The frequency of CFUs in each sample before and after removal of RBCs using ErythroClear™ is not significantly different and highly correlated in the samples tested (correlation coefficient R2 = 0.83). The average recovery of total nucleated cells (TNCs) after RBC depletion with ErythroClear™ was 75%. *Each kit is suitable for processing 2 mL of cord blood as 20 x 100 μL samples. Aliquot up to 100 μL of fresh or frozen cord blood into an empty 1.5 - 2 mL tube. Repeat for each additional sample. Incubate for 1 minute at room temperature (15 - 25°C). 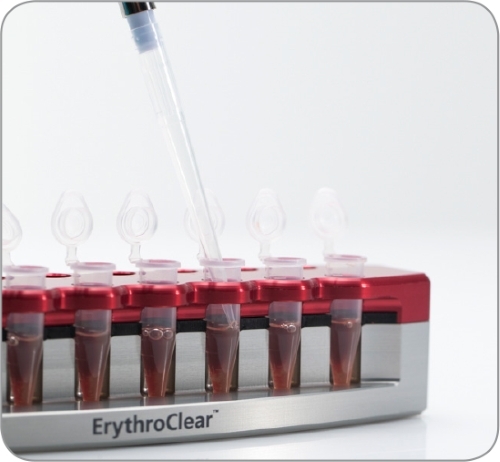 Place tubes into ErythroClear™ magnet and separate for 1 minute at room temperature (15 - 25°C). Harvest the RBC-depleted supernatant from each tube by pipetting from the side opposite the magnet surface. Note: A P-1000 pipette tip or smaller is recommended for harvesting the RBC-depleted supernatant. Cells are immediately ready for counting and downstream CFU assays or flow cytometric analysis. Shown are the percentages of GlyAB-CD45+ cells that are CD34+ in cord blood samples before (light gold) and after (gold) RBC depletion with ErythroClear™. There was no significant difference in the frequency of CD34+ cells before and after RBC depletion for each sample (p>0.01). The recovery of CD34+ cells after RBC depletion with ErythroClear™ was 70%. Additionally the frequency of GlyAB-CD45+ that are ALDHbright (data not shown) was not significantly different after ErythroClear™ treatment (p>0.01; data not shown), and the recovery of these cells was 66%. (n = 8 frozen whole cord blood samples, processed and analyzed separately in triplicate; columns with error bars represent mean ± S.D.). *Based on an average starting ratio of 130 GlyAB+CD45- RBCs to 1 white blood cell (WBC) in whole cord blood and a final average ratio of 0.25 RBC:1 WBC in a sample depleted with ErythroClear™.